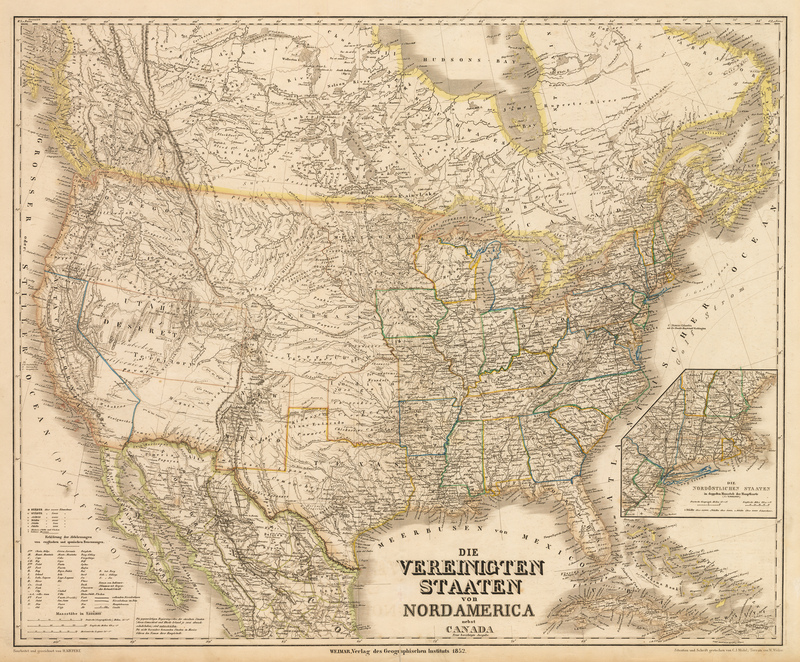 This rare German map of North America is large, highly detailed, and extends into both Canada and Mexico. A large region bordered by California, the Oregon Territory, Mexico and New Mexico, as well as a huge Nebraska Territory, is labeled ‘Utah Deseret Territory’. This is a region which was proposed by Mormon leadership in 1849, but never recognized by the US Government. Indian Territory extends well into present-day Kansas and the enormous Nebraska Territory extends to the Canadian border, with Minisotah Territory to the east and Oregon Territory to the west. New Mexico Territory extends into Arizona and north into Colorado. The Black Hills of modern-day Minnesota are depicted as part of the Nebraska Territory. All states and territories are depicted with superb detail of railroads, emigrant roads rivers and topography. Indian tribes are named and noted in their territories throughout the map. An inset map in the lower right quadrant depicts New England in great detail. The map was drawn by H. Kiepert and engraved by C. J. Maedel. Finely drawn hachure is used to depict relief. This is a rare map which is finely engraved in the German style of its day. Condition: This map in B+ condition has its original hand coloring. There is minor offsetting, with light toning at three edges. A centerfold separation just touches the bottom neatline and a tear enters one inch into the image in Hudson Bay. Both have been repaired with archival materials on the verso.